Peter Capaldi will be the Doctor! I've shared this picture, which should be visible on the other side of this link elsewhere. 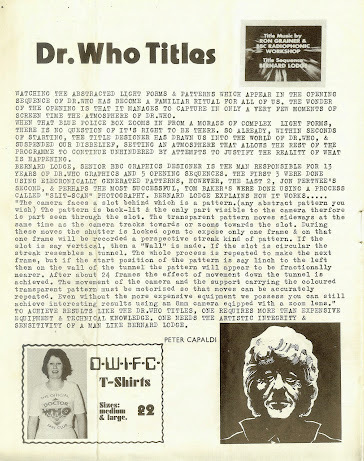 It shows an article from DWIFC Magazine issue 2, published by the Doctor Who International Fan Club, back in May 1976, in which one Peter Capaldi praised the creativity and integrity of Bernard Lodge, title sequence designer for the first seventeen years of Doctor Who. Now we have a chance to see how Peter Capaldi brings his creativity and integrity to the title role. I'm sure he has both in spades. I should be concentrating on something else right at this very minute, but fannishly have let myself be caught up in the reaction wave. I hoped that the rumours surrounding Capaldi were true, but I also feared that the powers-that-be at the BBC would want another, younger actor who could use the role as part of a stepping-stone to greater international success. Instead, we have a mature actor - by the time his first full episode goes out he will be the oldest actor to play the role at debut - with a distinguished and individual career, who anciently just happened to be an active fan in the early years of Doctor Who fandom. I rather like that! Very busy today, and I could have written a longer post on this subject, but given that I gave some thought to this last time round, briefly-researched thoughts on the name the next pope might take. Leo XIV was favourite at bookmakers Paddy Power the last time I looked; it has associations with strong papal authority (especially Leo I, 440-461) and the marriage of evolving pastoral needs and conservative theology (Leo XIII, 1878-1903) which would probably appeal to many cardinals. Gregory XVII would be a name evoking similar associations with papal authority, but also with the reforms of Gregory VII in the eleventh century. The name could be reclaimed from associations with the reactionary nineteenth-century pontiff Gregory XVI. Nicholas VI appeals to me as bringing a papal name neglected since the fifteenth century back into use. As well as religious orthodoxy (the career of St Nicholas of Myra), generosity and present-giving (St Nicholas's subsequent emergence as Santa Claus) the name has associations with papal authority, given the drive of Nicholas I (858-867) for a monarchical authoritative papacy in the ninth century, and the establishment of the college of cardinals as the electoral body for the papacy in the eleventh century under Nicholas II (1058-1061). Eugene V might suggest compromise given the openness to a conciliar approach promised by the last pope to bear that name, Eugene IV (1431-1447), but his inconsistent ways of keeping that promise led to chaos in church and the Papal State. Clement XV would revive an old standby associated with Rome and the early church (Clement I, c.91-c.101, as well as the later church father St Clement of Alexandria) and with eleventh-century reform (Clement II, 1046-47) as well as the establishment of Catholicism on the American continent (Clement VII, 1523-34). The papacy of Clement XIV (1769-74) is associated with the shame of his suppression of the Jesuits, though at the time it was widely understood as a welcome rapprochement with the leaders of the European laity, something which some commentators think is necessary today. An unlikely name which crossed my mind when looking at the Bohemian origins of Christoph Schoenborn was Sergius V, as Sergius II was pope when the leaders of the Czechs volunteered for baptism in the 840s. However, this action had nothing to do with the papacy, which was going through one of its weaker phases of influence over the western church at the time, and the subsequent popes Sergius III and Sergius IV were both mired in the decadence and corruption of Roman politics, which critics of the Vatican might think too appropriate in all the wrong ways. Given that in francophone countries the next pope Sergius would be known as Serge V, this would lead to numerous mash-ups of the hapless pontiff blessing away with Serge Gainsbourg and Jane Birkin breathlessly performing 'Je t'aime...moi non plus' on the soundtrack, which I suspect would not be wanted. The Daily Telegraph reports on Star Trek aftershave. Congratulations all: especially to Sir Christopher Lee, of course, and to Mrs Anderson my goddaughter's head teacher, who becomes an OBE; as does Peter Dickinson, author of the Changes trilogy whose television adaptation I watched avidly as a five-year-old. ETA: Robin Myers, the bibliographic historian, gets an MBE, which is well-deserved. A patron saint for the United Kingdom? The Independent reports that Dr Ian Bradley from the University of St Andrews has proposed that St Aidan become patron saint of the United Kingdom. As someone for whom stories of Aidan, Oswald, Cuthbert and all were the stuff of first school history, I am attracted to this idea; though doubt whether a St Aidan's Day would at first attract even as little attention as St George's Day has until recently. I don't comment on world affairs very much in this journal, as there are others who probably have more insightful things to say. This post is shorter than it might be because I am meant to be writing about an eighteenth-century duke (not for LJ). As a child in the 1970s, however, one could hardly miss the constant references to Rhodesia on television news. I remember Bishop Muzorewa becoming prime minister of Zimbabwe Rhodesia, and later read his memoir Rise Up and Walk; and remember Lancaster House and the constitutional dance that saw the country once more become the British colony of Southern Rhodesia, with Lord Soames as governor, before the general election that brought ZANU and Robert Mugabe to power as prime minister of Zimbabwe in 1980. Later that decade, in 1988, one of my A-Level history teachers emigrated to Zimbabwe, depressed, she said, by the tendency of British and other European politicians to follow perceived trends among the voting public - Robert Mugabe, she told us, was a leader of a calibre no longer found in Europe, dedicated to challenging the people and uniting them around a common purpose. I wonder where she is now. I am not surprised by current developments, sadly, particularly ZANU-PF's decision to challenge the electoral count before the results have been publicly declared. I think that for many on the government side in Zimbabwe, elections ought to be ways for the Zimbabwean public to pay homage to the blood sacrifice made by the guerilla movements in the war against Ian Smith's Rhodesian government in the 1960s and 1970s, where history has been edited to make Mugabe the sole military leader. For a majority of Zimbabweans to have voted against ZANU-PF would thus appear an act of apostasy from the national faith, to which the people have to be reconciled, by force if necessary. I am unenthusiastic - the design scheme is more Anglocentric than any other in the past century (the royal arms change when the monarch is in Scotland, but there is no 'Scottish' set, as in the days when there were 'English' and 'Scottish' shillings in circulation throughout the UK) and Welsh and Northern Irish symbols are also absent. In their attempt to be inclusive, the Royal Mint have given an impression of ignorance of the multiple strands of 'traditional' - their justification, as explained by an unimpressive Sir Christopher Frayling, chairman of the mint's advisory committee, just now on BBC News 24 - identity within the United Kingdom. The new designs can be seen here at The Times. Edit: Perhaps I'm overreacting. The shield has been cut in a way that tries not to overrepresent England and complements the harp of the kingdom of Ireland (breaking with recent coinage tradition which has attempted to develop emblems specifically connected to Northern Ireland, such as the flax plant); but I'm still not greatly happy. Reported in yesterday's Daily Telegraph; and the second of these to be noticed by me in the news media in a week. The aspect that catches my attention is the statement that "Dr Who is still fighting the time war", which is I think the first time that I've seen this item of the mythology, effectively introduced by Russell T Davies, treated as a standard aspect of the character in a newspaper article not written to promote or comment on the series. Interesting. Arrests have been made over the 1972 Claudy bombing; and also over last year's robbery of the Northern Bank in Belfast. Has some sort of deal been done, by which the IRA are handing over those who have never been arrested in return for the controversial Fugitives Bill?